Glasgow, Scotland’s largest city offers plenty to see and experience all year round. There is always something going on and there is always something new to discover, no matter how many times you have been to the city before. 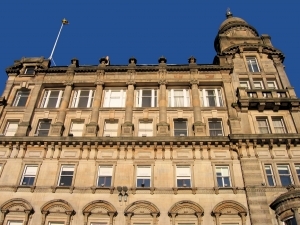 Listed below are only a few suggestions on how to experience all the best Glasgow has to offer. Despite Glasgow’s rich history, most of today’s cityscape dates from the 19th century. Nevertheless, Glasgow is home to many world-class landmarks and architectural gems ranging from masterpieces of Victorian architecture to gems of the so-called Glasgow School and modern architecture, with the Foster’s Clyde Auditorium (also called the Armadillo) and the Glasgow Science Centre being the finest examples. Glasgow is home to all Scotland’s premier cultural institutions including the Scottish Ballet, Scottish Opera, the Royal Scottish National Orchestra and some of the finest art galleries, museums and theatres in the entire Scotland. If you like art, you will love the Kelvingrove Art Gallery and Museum, the Gallery of Modern Art, the Hunterian Museum and Art Galleries, and a number of smaller art galleries throughout the city. If you like theatre, you won’t regret visiting the Theatre Royal, King’s Theatre or Citizens Theatre, to mention only a few of the most prominent ones. Speaking about prominent, you mustn’t miss the Riverside Museum that won the 2013 European Museum of the Year Award and is an attraction of its own. Also worth visiting are the Provand’s Lordship, one of only a few surviving medieval buildings in the city, the National Museum of Scottish Country Life and if you like football – the Scottish Football Museum. Football fans know Glasgow not only as home to the Scottish Football Museum but also as home to the Rangers F.C. and Celtic F.C. which are based at the Ibrox Stadium and the Celtic Park, respectively. So if you are planning to visit the city during the football season, you will be able to catch at least one match on either of the two football teams at their home grounds. In 2008, Glasgow was awarded the prestigious accolade of the “UNESCO City of Music” for its rich music scene. The city is indeed home to a number of internationally acclaimed music festivals and events, premier live music venues and countless clubs, pubs and bars with a highly diverse music styles, genres and artists.